New York, 1938. Name's Jones. Freddy Jones. I'm the Jones in "Dinkley & Jones," the names of the detectives painted on the glass of my office door. I sat at my desk, lifting a glass of to the memory of my partner Velma Dinkley, who'd taken an early dirt nap after wrestling with the business side of a .38. A redhead came through the door. Ordinarily, I like redheads like a john likes a slap, but this one was different. She looked like a New York Herald with a mean streak: bad news. Said her husband had been cheating on her. She'd caught him in the act with a dimestore floozy, and now he was laying on their bathroom floor in a puddle of his own shallow red. Claimed she was innocent. After the broad and I bartered and she left happier than when she arrived, Shaggy showed up. He's a pill-pony, goes nutso for some concoction an old doc makes up just over on the Jose side of the Mexican border. Calls 'em "Scooby Snacks." He'll eat a handful of 'em and wake up the next day not remembering what he's done. That can be convenient for me, so I always keep a supply, because he knows the inside of every hooch parlor between here and the Battery. "Where's your dog?" I growled, but he was in no shape to answer. Besides, I knew. That dog used to be a brakeman on the NY Chicago line, the Red Ball Express. There was an accident. Some kids were killed. 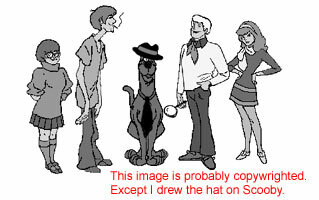 Evidence showed the kids had been meddling, but Scooby got on the wrong side of the DA and took the fall. That was fifteen years ago. Now he's sprung from the Big House, and spends his days in his tenement looking out the window in between belts of Kentucky lipstick, building enormous sandwiches, sandwiches so big he could never get his mouth around them. Never in a million years. John Leary lives in California. He has a novel called A Thousand Little Kings that he would like to publish.